Off the Record: Rachel Moon | BANG. Amid the frantic energy of finals week, the point in the semester when students become engrossed in the stress of exams and their frenzied efforts to complete polished final papers, Rachel Moon, MCAS '19, took time away from her studies and incessantly busy life as a pre-med student to share with us the perfectly tailored craft of her music. Sporting her typical gray converse paired with a similarly colored gray tank top and hoodie, finished off with some blue jeans, Moon took the impromptu stage in the lobby of Lyons Hall on Boston College's Main Campus. Having lugged her own equipment between buildings as we scoured the campus in search of an available space to record, Moon was eager to play her newly purchased custom ASAT Classic Bluesboy semi-hollow guitar. After a brief on-the-spot deliberation, Moon decided to play one of her original songs, "Falling." The combination of Moon's effortless, smooth guitar riffs and her soft yet distinct vocals made for a sound that is impossible to replicate. Moon described her song as a "run-of-the-mill love song." While the meaning of the song stems from an experience with love, there are a myriad of ways to interpret its lyrics. "Sometimes life is weird or whatever, and you gotta take the leap, and it's scary because the floor is gone from under you, but sometimes you fly, and that's pretty cool," Moon explicated. "There's a pretty fine line between falling and flying, but maybe flying is just falling with style." Moon began her music career with the violin, but on one fateful day around the age of 13, she came across the guitar. "I went to my friend's house and he was playing the guitar, and I was like, 'Psh, if he can do that, I can too.' So I went home and begged my Mom for a solid two months to let me learn to play and eventually I wore her down. She thought I wouldn't stay with it and it would be a waste of money." As soon as she laid her eyes on the six-string instrument, Moon was captivated by the need to play. Nothing dwindled her desire to learn, not even her mother's uncertainty of the legitimacy of her passion. After two years of classical guitar training, Moon encountered a genre of music that appealed to her taste and talent more than anything she had heard before: blues. Moon stopped taking guitar lessons and instead taught herself blues guitar. Moon's musical influences vary, but she has found John Mayer, B.B. King, and Stevie Ray Vaughn particularly inspiring. "I wouldn't say I try to emulate any style, but all of it kind of mixes up in my ear and makes an appearance on occasion." 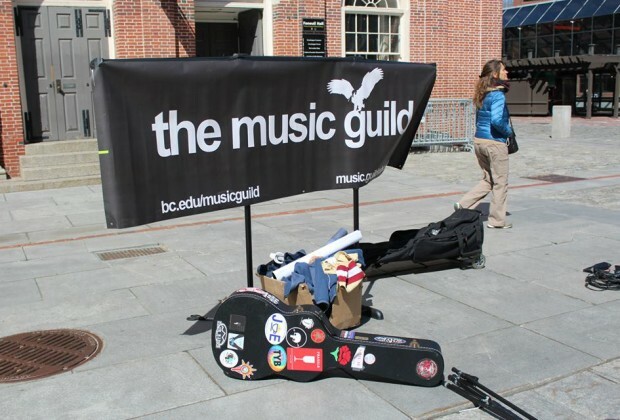 By joining the BC Music Guild her freshman year, Moon was given a platform to not only meet other BC musicians but also to showcase her music by performing both on and off campus. "I've met some of my best friends through the Music Guild," she shared. There's nothing like connecting with someone through music. I never did any singing before coming to BC, and now I front a band, so yeah, the Music Guild has been pretty great to me." Last Spring, Moon was selected as a finalist in the singer-songwriter competition during BC's Arts Fest. More recently, she performed with her band, "Unit One," at BC Music Guild's Fall Band Showcase. As far as a future in music, Moon hopes to continue creating music and dreams of turning her passion for music into a career. "It's my dream at least, but a lot of the time I feel like it’s just a dream. If all I ever accomplish in music is getting that feeling, the one that only music can give me, and maybe give that feeling to someone else once in awhile, I'll be happy." After hearing her play, it's safe to say that Rachel Moon is well on her way to giving us all that indescribable feeling that only music can give as she shares her carefully crafted riffs and soulful lyrics. Fall Out Boy returns...they were gone?